Pablo Montes Iannini analyzed the city’s capital planning and budgeting for new building and major renovation projects. Pablo Montes Iannini spent his summer at the City of Boston analyzing the City’s capital planning and design of new building and major renovation projects. Iannini recommended energy efficiency improvements and helped the City to assess the impact of energy-related decisions on future operating budget obligations. Iannini identified existing federal, state and local mandates promoting energy management in new construction and major renovation projects. He also identified a number of tools and resources available to help the City make complex budgeting decisions. 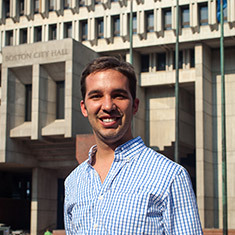 Pablo Montes Iannini, a student at Yale University, was hired as the 2013 EDF Climate Corps fellow at City of Boston.